Durban YMCA is part of the international YMCA movement, which has its origins in London, England, in 1844. George Williams, appalled by the conditions in which apprentices and shop assistants were made to live and work, established a prayer and Bible Study group, which was the nucleus of the YMCA, established on 6 June 1844 to meet the spiritual needs of young workers. The movement expanded rapidly throughout Britain, and focussed on caring for the physical, intellectual, and spiritual needs of the young men. This threefold emphasis on Body, Mind and Spirit gave rise to the Red Triangle, the instantly recognisable international symbol of the YMCA. 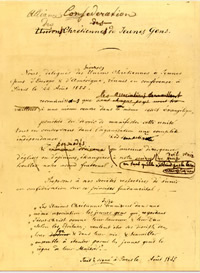 Wider international expansion followed, and the World Alliance of YMCAs was formed in Paris on 22 August 1855, where the founding document, now known as the Paris Basis, was signed. The actual date of the formation of Durban YMCA is unknown as the records were unfortunately destroyed in the late 1970s. There is a record of a meeting in Durban in 1864 at which the possibility of starting a YMCA in the city was discussed. This did not come to fruition, as the official start date of the South African National Council of YMCAs is 1865. The earliest record of a meeting at Durban YMCA was a public lecture given by Dr Bonner on “The Technology of the Human Body” on 29 June 1876. Several other references appear between 1876 and 1900, but it appears that there was no consistency, due to apathy, the attitude of some YMCA officials, and shortage of finance. By 1901 calls were being made for the consolidation of a YMCA presence in Durban, to provide a home-like boarding house which incorporated a gymnasium, various clubs and societies, and educational classes. The timing is significant. It was the penultimate year of the Anglo-Boer War, which brought young men through the port of Durban, and drove young men to the city from the rural areas due to the uncertainty of the agrarian economy which results from war. A significantly increased number of young men in Durban increased the sense of need for a healthy alternative to the public houses bars and brothels that were flourishing in Durban. The revival of the movement in Durban took shape at a meeting in the Baptist Church in West St in August 1901, with the election of a Provisional Committee for Durban YMCA. Support for this initiative came from the Natal Mercury, the Baptist Association, the Pietermaritzburg YMCA, the Durban Christian Minister’s Association, and the Durban Church Council. On 23 January 1902 an inaugural meeting, attended by 100 people, shifted the status from a Provisional Committee to a full Association. The constitution was adopted in December of that year. With the support of Durban businessmen, most notable Mr E.L. Acutt and Sir Benjamin Greenacre, sufficient funds were generated for the purchase of a site, and the erection of a building. The first YMCA Residence building, on the corner of Hermitage Lane and the Esplanade, was launched with the official foundation stone laying ceremony on 21 March 1904, culminating in the official opening on 6 April 1905. The address has changed twice over the past 101 years: during the 1930s Durban YMCA relocated to the corner of Beach Walk and the Esplanade, when it purchased the Cable and Wireless building, and carried out various upgrades and renovations over the years, and in 2000 relocated to the present address 82 St Andrews Street. The aim has remained consistent: to provide a home-like boarding house which incorporated a gymnasium, various clubs and societies, and educational classes. In 2011 the SA YMCA requested Durban YMCA to pilot the formation of the Greater Durban YMCA, incorporating the former Amanzimtoti YMCA and Kwa Mashu YMCA, until then autonomous Local Associations which were struggling for survival. Greater Durban YMCA currently offers accommodation to students, has a gymnastics club and a growing fitness centre, runs some clubs and societies, and hosts others, and has a Computer School on the premises in the inner city, and has capacity for 16 residents and space for programmes and community events at the Kwa Mashu site. The Young Men’s Christian Associations seek to unite those young men who, regarding Jesus Christ as their God and Saviour, according to the Holy Scriptures, desire to be his disciples in their faith and in their life, and to associate their efforts for the extension of his Kingdom amongst young men.